Warhol: The Last Decade examines the work of American Pop artist Andy Warhol (1928-1987) from 1981 until his untimely death in 1987. During those final years, Warhol produced more works, in a greater number of series, than at any other time in his forty-year career. Encompassing over thirty works, Warhol: The Last Decade demonstrates a time were Warhol simultaneously worked with his characteristic screen prints while pursing a reinvention of painting. ​It was during this decade that Warhol found huge artistic development and saw a dramatic transformation of his style with his renewed spirit for experimentation. His later works also saw the influenced of many prominent artists of the 1980s. Artists Jean-Michel Basquiat, Keith Haring, Julian Schnabel and Francesco Clemente all saw collaborative outputs in which Warhol further developed his extraordinary vocabulary of images that bridged a variety of genres. The motif of the dollar bill is forever reoccurring throughout Warhol’s career. 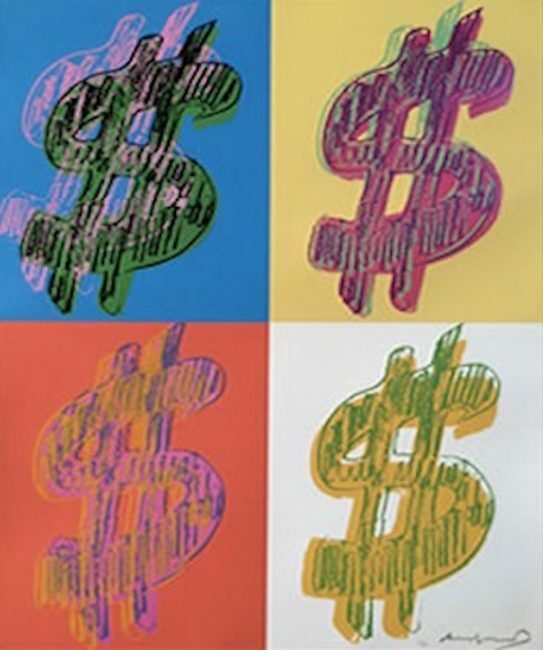 He first produced the breakthrough series in 1961, but later return to create the 1981 Dollar Signs portfolio. These works are rampant with vibrant hues and layered energy and epitomizes Warhol’s singular artistic vision, one that would surprise and captivate in the 1980s and has continued to do so more than three decades later. 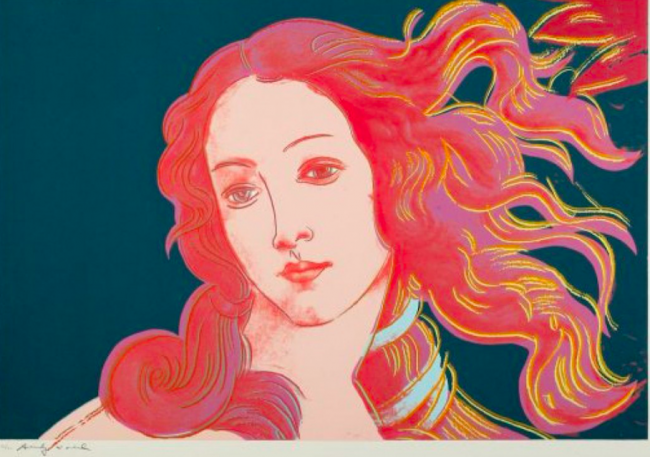 ​The Myths Portfolio is one of Warhol’s most sought after collections. 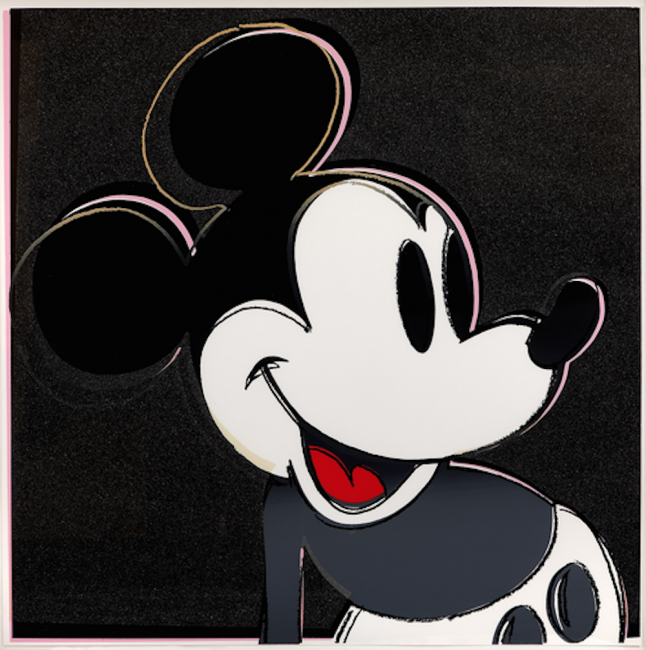 The portfolio sees ten screen prints in which the artist refers to the beginning of cinema and the imaginary characters that are recognized and loved by millions all over the world. Available from this 1981 collection are characters loved by popular culture including Mickey Mouse, Superman and Dracula. 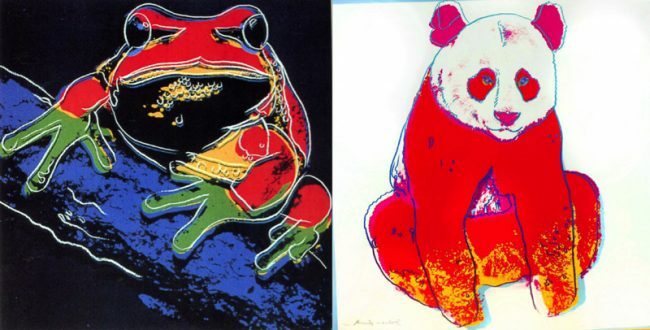 ​Also showing in this exhibition are works from Warhol’s 1983 Endangered Species series. The series consists of ten color screen prints that portray endangered animals from around the world including the Tree Frog and the Giant Panda. Using brilliant colors and this characteristic style, Warhol poignant expression are suggestive of the animals fate, creating dynamic tension between art and reality. 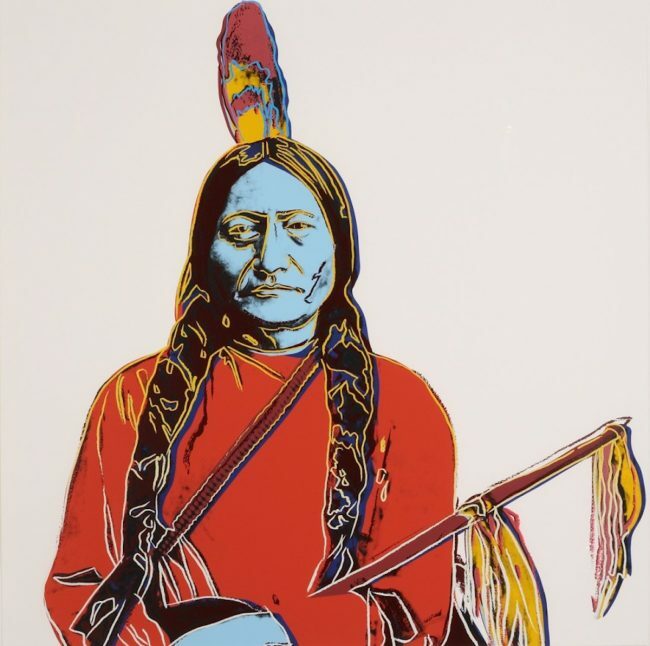 ​In 1986 Warhol produced the Cowboys and Indians collection. This series of screen prints creates a didactic commentary on mass media and the way in which contrived imagery can affect how we understand our history. Native American motifs are portrayed in a popular, romanticizes versions of the American West, rather then within their historical landscape, along side portraits of the well-known American heroes such as John Wayne and Teddy Roosevelt. ​The Camouflage paintings reflect the synthetic and inorganic colors, which would not provide veil or disguise in any landscape. Warhol died in the midst of completing the series, which are consequently signed and stamped by Frederick Hughes, the executor of his estate. Since then, the Camouflage prints have continued to grow in popularity and significance, particularly with America’s continuing military involvement in the Middle East. 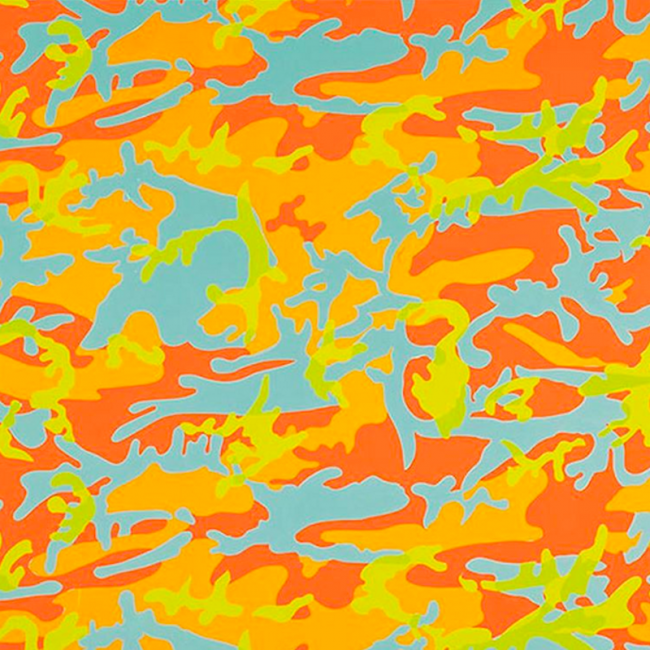 ​Warhol’s versatility and imagination saw his last decade explored with new work. Warhol: The Last Decade illustrates the artists vitality and energy which has seen him remain one of the most influential figures in contemporary art and culture. This exhibition also includes works from Warhol’s collections including Camouflage, Moonwalk, Beethoven, Ads Portfolio, Birth Of Venus, and Ingrid Bergman. 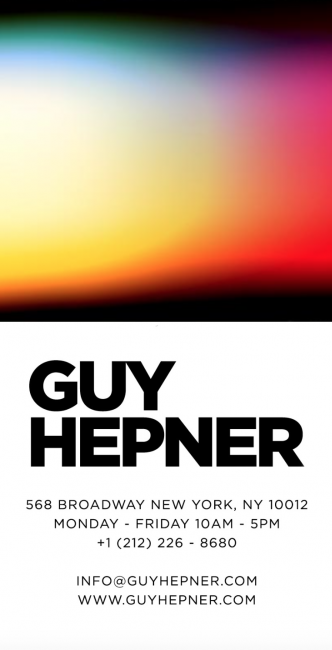 Guy Hepner is please to offer Andy Warhol originals, papers, paintings, prints, and canvases. Inquire about prices via phone or email.